When George Hartzell produced his first aircraft propeller, the technology of the digital age was nothing more than science fiction. Advanced materials, like those used in our composite airplane propellers, were also just a far off concept. The story of Hartzell’s evolution from wood, to aluminum props to the modern composite propellers of today touches nearly a century of American history. Now, we are embracing the technologies of the digital age to share that story and many others. You can now follow Hartzell’s continuing evolution across multiple social networks. Our goal has always been to maintain a deep connection with the worldwide aviation community — many Hartzell team members are aviators themselves. We want to hear piloting experiences and share our passion, technology and stories from some of the biggest names in aviation. Read on to find out which channels you can find us on, and stay tuned for updates as we continue to engage with the thousands of pilots and enthusiasts who have made Hartzell a success. If you are reading this, you have already taken the first step into the Hartzell community. Our blog will be updated regularly with photos, aviation news, stories of our travels around the world, videos of the world-class aerobatic teams we support and little-known gems from the annals of aviation history. We will also be covering the world famous Red Bull Air Races, including behind the scenes photos and videos from our team on the ground. Our Facebook page offers a look behind the curtain at Hartzell. Our team in Piqua, OH will be sharing photos and stories of their efforts to bring world-class airplane propellers to every corner of the globe. It will also feature the best content from our blog — with a twist: we want all of our Facebook fans to tell us what they think. We live for aviation, that is what we mean when we say it is “in our DNA.” Now we want to extend that community outward. Follow us on Facebook to take advantage of the immeasurable experience Hartzell’s team has accrued over the years, and help us share our knowledge with others. If our Facebook page is like a window, letting the world take a look inside Hartzell, then our Twitter account (@HartzellProp) is like a door out into the world. Follow us on Twitter as we engage in global conversations about the future of aviation, highlight the achievements of local pilots, and bring you up to the minute news from top airshows and air races. This is Hartzell Propeller in action as a world leader in aviation. We have been watching the world from the window of a plane for generations. Over that time we have taken some amazing photographs. These images from aviation history, photos with great aviators and memories of travel mean a great deal to the Hartzell team. Now we want to share them with the world. Our Pinterest account showcases the one-of-a-kind merger of technological prowess and aesthetic bliss that is the miracle of human flight. Follow us as we share images reflecting a passion for aviation as old as the airplane itself. Pushing boundaries has made Hartzell the worldwide leader in aircraft propeller manufacturing; this is just another step on that journey. 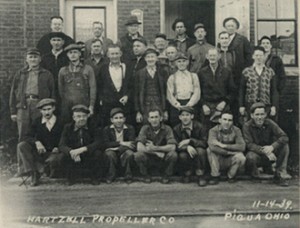 Watch for updates as we continue to engage the community of pilots and aviation enthusiasts who helped make Hartzell Propeller “Built on Honor,” since 1917.